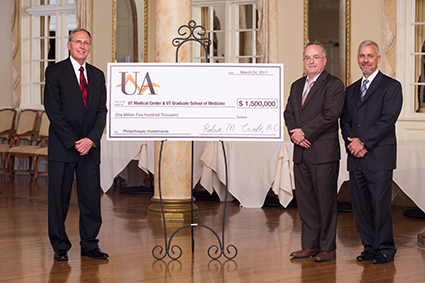 Robert M. Craft, MD, Chair of the Department of Anesthesiology and University Anesthesiologists’ Chief Manager, recently announced that the physician group, University Anesthesiologists, has made a four-year $1.5 million philanthropic commitment to The University of Tennessee Medical Center and the UT Graduate School of Medicine. The contribution will fund initiatives including educational and training opportunities for anesthesiology residents and nurse anesthetists, expanded faculty training and development, program and equipment needs at the UT Center for Advanced Medical Simulation and impactful fundraising endeavors that benefit the medical center’s Centers of Excellence and other organizational priorities. Craft also announced plans to establish an endowed chair in the Department of Anesthesiology. This endowment, once fully funded, will be named for Dr. Jerry L. Epps, former chairman of the Department of Anesthesiology and current chief medical officer for UT Medical Center. The endowed chair will offer additional financial support to further the department’s goals, assist the Department of Anesthesiology in recruiting and retaining nationally recognized faculty, and provide discretionary funding to elevate academic programs, propel research, and make innovative advances in the department’s scholarly work. Since its founding in 1979, University Anesthesiologists (UA) has provided the physician leadership for the UTMC Department of Anesthesiology and the Anesthesiology Residency. As such, the UT Medical Center mission to serve through healing, education and discovery is central to the UA’s mission, making UA virtually synonymous with the Anesthesiology Department at UTMC for 38 years. The members of the Department of Anesthesiology at The University of Tennessee Graduate School of Medicine (UTGSM) work together for a single purpose: to provide the best possible perioperative care for all patients. The anesthesia care teams provide services for approximately 45,000 procedures in the operating rooms and satellite anesthetizing locations such as the obstetrical suites, the gastroenterology outpatient center, radiology department, cardiovascular laboratory and the University of Tennessee Ambulatory Surgical Center. For over five decades, our core training philosophy combines progressive clinical responsibility with careful supervision to maintain patient safety and resident support. The caseload of our Level 1 trauma center provides a broad-based clinical experience and upon completion of the residency, our graduates easily achieve board certification and are wll prepared to serve patients in their future practices. The University of Tennessee Graduate School of Medicine in Knoxville is part of the University of Tennessee Health Science Center, the statewide academic health system.Â The school is home to more than 400 full-time and volunteer teaching physicians, dentists and researchers and more than 200 resident physicians and dentists in 11 residency and 10 fellowship programs. As part of the statewide College of Medicine, medical student core third-year rotations and fourth-year electives are also offered. The school, together with clinical partner University Health System Inc., form The University of Tennessee Medical Center, the only academic medical center in the area and whose mission is to serve through healing, education and discovery. The mission of The University of Tennessee Medical Center, the region’s only hospital to achieve status as a MagnetÂ® recognized organization, is to serve through healing, education and discovery. 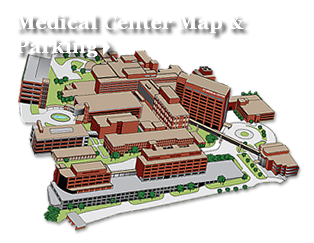 UT Medical Center, a 609-bed, not-for-profit academic medical center, serves as a referral center for Eastern Tennessee, Southeast Kentucky and Western North Carolina. The medical center, the region’s only Level I Trauma Center, is one of the largest employers in Knoxville. For more information about The University of Tennessee Medical Center, visit online at www.utmedicalcenter.org.